$29 per month $299 per year Save $49 ! A house with mulitple levels counts as one project. When you run out of projects, you can always buy extra! Enrich your floor plans with photos & videos. View your floor plans on your iPad and iPhone with the Floorplanfinder app. Export high-res images for brochures and other promotional purposes. Create stunning 3D rendered visuals of your floorplan. Export your floor plans at various scales. 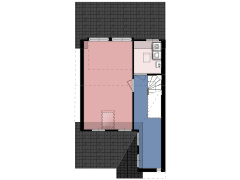 Show your interactive floor plans directly on your website. Add your company logo and branding to your floor plans. Every staff member can login and manage their own floor plans. All with one account! Do I need to download anything to start using Floorplanner? Absolutely not! Floorplanner is an online service and works in your web browser. What web browsers work with Floorplanner? Floorplanner works in all major browsers, like Google Chrome, Firefox, Internet Explorer and Safari. For the best user experience, we recommend using Google Chrome. Our mission is to let everyone in the world make better use of their space. Therefore we offer a free Basic account. With a free account you can draw one floor plan. If you need more floor plans or more and better features, please consider upgrading to our Plus or Pro accounts. How can I pay for a Plus or Pro account? It's easy to purchase Floorplanner subscriptions online. You can pay with the following methods: VISA, MasterCard, Maestro, American Express, Paypal, iDEAL, AliPay, DineroMail, DIRECTebanking, ELV, SafetyPay and Solo. Our Plus account is billed per year. Pro users can choose whether they want to pay per month or per year. After you set up your payment, you don't have to worry about your billing anymore. To make things easy, we will handle following payments automatically. All invoices will be sent to you, so you will always be up to date. Can I use a Plus account for professional purposes? Only the administrator of the account will get all the info and updates about billing. Yes. You can always up- and downgrade your plan. Please check out if your question is answered in our more extensive FAQ. If your question is not answered here, you can send an email.